– 5:10 PM: The court has just announced Mother Mushroom’s sentence: 10 years in prison. There are many people participating in the public hearing, but in reality, many people have not been able to even enter the court. The article posted a photo showing Mushroom’s mother attending the trial, but in the picture, no one was Ms. Lan, Mushroom’s mother. – 1:45 PM: Trinh Kim Tien interviewed Lawyer Vo An Don after the morning trial. Mother Mushroom has five lawyers but only three lawyers are present, including Vo An Don. Apparently, Mushroom proposed to postpone the trial, but it was not approved. Her attorneys ventured to meet with her, but they were also dismissed. 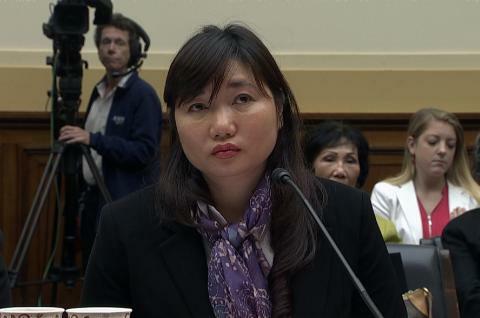 All the while, Mushroom is still being denied to see her Mother, Ms. Lan. – 1:00 PM: Trinh Kim Tien interviewed Ms. Lan after she left the courtroom. She explained that she was not in the actual trial room, but was instead taken to a separate room to watch it all on television. According to Ms. Lan, Mother Mushroom was not able to present her own argument and view without being interrupted. Ms. Lan claims that the 8-10 year jail proposal by the procuracy was a completely unjust sentence and it only served to expose the regime’s immorality. – 12:50 PM: Lawyer Le Luan, advocate for Mother Mushroom, shared on Facebook this morning: I request the convening of three assessors of the Department of Information and Communication Khanh Hoa province on many terms. The argument “I find it difficult to understand,” that the chairman spewed at my request is not justified should be reconsidered. 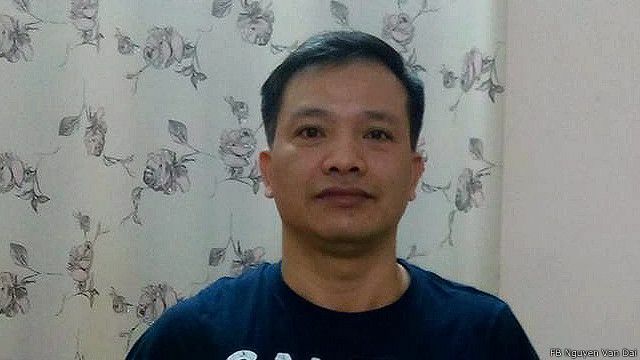 – 12:00 PM: Nguyen Minh Bao Ngoc, cousin of Mother Mushroom, has been arrested and taken to the Xuan Huan Police Station (address: 11 Phan Boi Chau, Nha Trang). Because of this, Ms. Lan and her family are moving to Xuan Huan to demand her release. – 11:45 AM: Lunch break; at 2:00 PM, the trial continues. Lawyer Le Kha Thanh reveals that the prosecutor has proposed 8-10 additional years in jail for Mother Mushroom. – 11:00 AM: Blogger Trinh Kim Tien has updated on Facebook that the morning trial is coming to an end. There is also a doctor, guarded by security, standing outside the court door for unknown reasons. – 10:40 AM: Young activists protest outside the courthouse by standing behind the barriers and duct-taping their mouths shut. – 8:35 AM: Outside the trial area, blogger Nguyen Ho Nhat Thanh hosted a live stream (https://www.facebook.com/paulothanhnguyen/videos/1545808958796675/) where he interviewed a few young supporters of Mother Mushroom. One of the supporters, young Phat, states that Mushroom’s sensible activism in fighting for human rights, against Formosa, is not malicious propaganda. It is not something to be afraid of. Another supporter named Nam claims that the authorities should honor Mother Mushroom as an international organization and peacekeeper, rather than condemn her. – 8:30 AM: The Khanh Hoa People’s Court opens the trial of Mother Mushroom, accusing her of committing “propaganda against the Socialist Republic of Vietnam,” under Article 88 of the Penal Code. There are four lawyers for Mother Mushroom in this trial: Nguyen Ha Luan, Le Van Luan, Nguyen Kha Thanh and Vo An Don. Two unidentified people, one woman and one young man, have been arrested in the court area simply for picking up their phones. More than 10 supporters that have traveled from Saigon to Nha Trang are standing 100 meters away from the court area, intermixed with the Khanh Hoa and Saigon security enclosures. Six of Mother Mushroom’s close friends are in the court area, and no one has been allowed inside, except Ms. Lan, Mother Mushroom’s Mother. However, no one is able contact Ms. Lan. This is possibly due to the fact that outside, there are many signal waves that are being jammed or tampered with by the Government. All means of communication are cut off. – 7:45 AM: Ms. Tuyet Lan, Mother Mushroom’s mother and blogger Trinh Kim Tien have begun walking to the courthouse, past the ring of police and secret services. They could not acquire a taxi or bus because of the heavy surveillance. Ms. Lan’s family had to resort to using a motorbike to get to the court. At about 7:45 am, Ms. Lan was admitted into the court area, but she did not know if she could go to the specific courtroom her daughter was in. 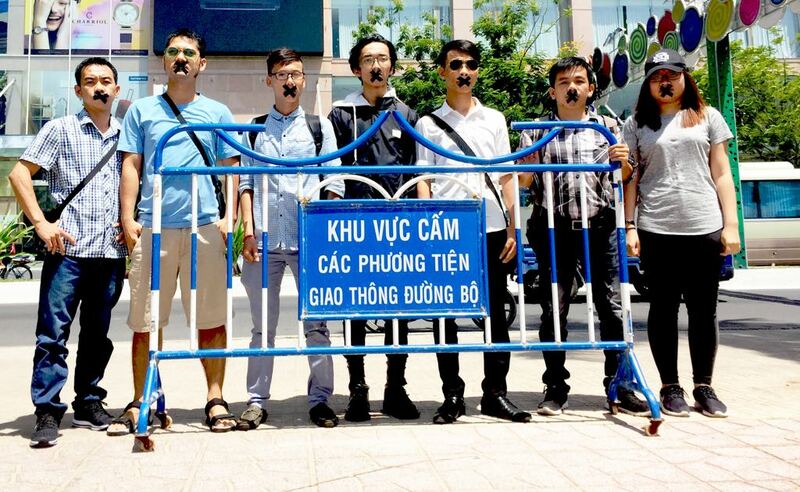 Meanwhile, blogger Trinh Kim Tien was blocked outside, despite her request to attend the trial as a related person. Tien was also asked to shut down her phone as she was shooting a live stream on Facebook. – 7:00 AM: The current situation is quite tense; it is difficult to approach the trial. The police forces are surrounding the trial within a 500 meter radius. The house of Mother Mushroom’s mother is also surrounded by nearly 20 police officers, some in uniform and some wearing ordinary clothing. – Yesterday afternoon (June 28, 2017): Mother Mushroom’s daughter and mother were allowed to see her, despite the countless barriers that were assembled to block away the public. 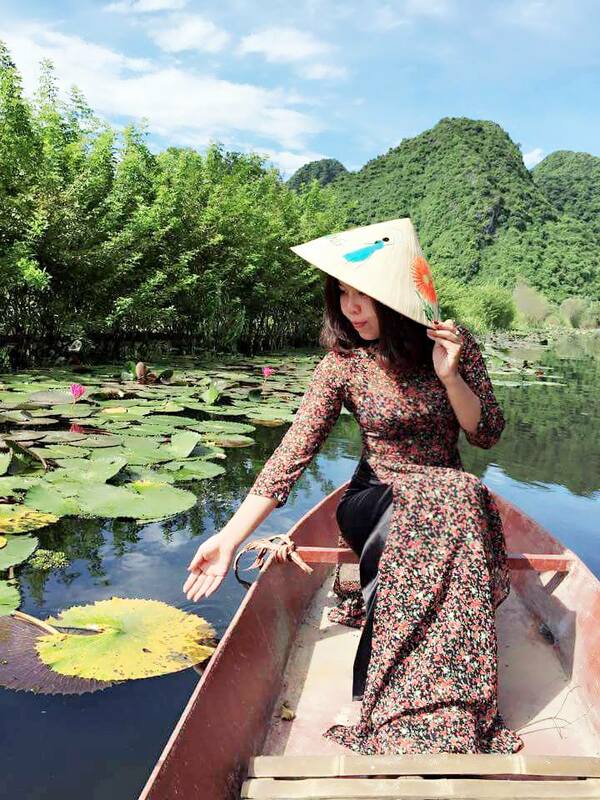 Background: Blogger Nguyen Ngoc Nhu Quynh, more commonly known as Mother Mushroom, writes about social equality and speaks out for democracy and human rights. Mother Mushroom was the Civil Rights Defender of the year in 2015, awarded by the Swedish Civil Rights Defenders Foundation. She was also awarded the International Woman of Courage Award in 2017 by Melania Trump, the First Lady of the United States. In relation to the aforementioned activities, she has been arrested several times between 2009 and 2016. However, the most eminent case and the reason for her trial today is based on her last arrest, which has kept her in prison from October 2016 until now. The German Association of Judges has named the detained Vietnamese lawyer, Nguyen Van Dai, as recipient of its human rights prize for 2017. The organisation, Germany’s largest professional organisation of judges and public prosecutors, honours a lawyer every two years for outstanding merit in the defence of human rights. Recent laureates have included lawyers from Syria, Iran and China. Nguyen Van Dai’s wife, Vu Minh Khanh, has led an international campaign for his release. The recognition for Mr Dai comes fifteen months after he was arrested on charges of conducting propaganda against the state under Article 88 of the penal code. Western government and international human rights organisations have all called for Mr Dai’s arrest, concluding that he is being held on trumped up political charges for his boldness in criticising the Vietnamese government. The award from the German Association of Judges, known by its German initials, DRB, serves as another reminder to the Vietnamese authorities that their crackdown on dissent has not been forgotten by the international community. The government reacted angrily last week to the announcement that the US State Department had honoured another jailed activist, Nguyen Ngoc Nhu Quynh, as an international woman of courage. Mr Dai was arrested in December 2015, a week after he was waylaid and badly beaten up by a gang clearly operating under the auspices of police commanders. He was returning to Hanoi after attending a training session on human rights and political rights held south of the capital. He has not been allowed a meeting with lawyers or family members since his arrest and has not been brought to trial. Dai is one of the best known of a number of activists and human rights campaigners arrested by the authorities. He came to prominence a decade earlier through his involvement with a pressure group known as the Brotherhood for Democracy. He served four years in prison and four years under house arrest for his earlier activities, only resuming his work after his release in early 2015. I am writing to you on behalf of the Council of Bars and Law Societies of Europe (CCBE), which, through the national Bars and Law Societies of the Member States of the European Union and the European Economic Area, represents more than 1 million European lawyers. In addition to membership from EU bars, it also has observer representatives from a further thirteen European countries’ bars. The CCBE places great emphasis on respect for human rights and the rule of law, and is particularly concerned with the situation of human rights defenders around the world. The CCBE wishes to express its serious concern over the situation of Nguyen Van Dai, a human rights lawyer who founded the Vietnam Human Rights Centre and the Brotherhood for Democracy. Mr. Van Dai has been in detention for nearly six months. We understand that, on 6 December 2015, as he was on his way back from leading a human rights workshop, Mr. Van Dai was beaten with metal bars by men identified as plainclothes police officers. Ten days later, he was arrested just before he was going to meet representatives of the European Union in Hanoi. His house was searched and officers confiscated his computers, USB sticks, cameras, and savings account’s bank book. He was subsequently charged with “spreading propaganda against the Socialist Republic of Vietnam” under Article 88 of the Vietnamese Criminal Code, which has been ruled in violation of international law by the United Nations Human Rights Committee. Mr. Van Dai has been in detention ever since, awaiting trial. If convicted, he faces three to 20 years in prison. In this context, the CCBE wishes to draw to your attention the Principle of the United Nations Basic Principles on the Role of Lawyers (attached), in particular Principles 16 and 22 on Guarantees for the functioning of lawyers, and Principle 23 on Freedom of expression and association. In view of the above, the CCBE respectfully urges your Excellency to take effective steps to ensure that the charges against Mr. Van Dai are dropped and that he is released, and to guarantee his safety and security. In addition, the CCBE asks you to guarantee in all circumstances that all lawyers in Viet Nam are able to express their opinions and perform their professional duties without fear of reprisal, hindrance, intimidation, or harassment. On 16 December 2015, prominent human rights lawyer, Mr. Nguyen Van Dai, 46, and his colleague, Ms. Le Thu Ha, 33, were arrested at their home and office in Hanoi, Vietnam, respectively. Both have been charged with “conducting propaganda against the Socialist Republic of Vietnam” under Article 88 of the Vietnamese Penal Code, a law that has been routinely and arbitrarily invoked by the government to suppress critical voices. Mr. Nguyen and Ms. Le are being held in B14 prison in Hanoi. Requests by activists to visit them have been rejected and there are concerns that they are at risk of torture and other ill-treatment. If convicted, Mr. Nguyen and Ms. Le could face up to 20 years in prison. We appeal to the Vietnamese government to honor its international and domestic obligations and to release Mr. Nguyen and Ms. Le immediately and unconditionally. We also call on the international community to act and put pressure on the Vietnamese government regarding these cases which have a severe chilling effect on freedom of expression in Vietnam. During Mr. Nguyen’s arrest, his home was searched thoroughly by approximately 20 police officers. His laptops, bank documents and many other personal items were confiscated, while his apartment remains under tight surveillance. 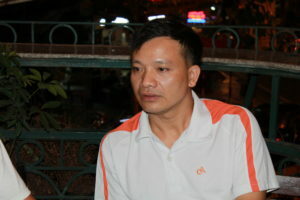 Mr. Nguyen is a well-known peaceful campaigner for a multi-party democracy and the protection of human rights in Vietnam. He has devoted his life to providing legal assistance to the most vulnerable and marginalized people in society. Mr. Nguyen has repeatedly been subjected to unwarranted persecution for undertaking his legitimate work. In 2007, he was convicted under Article 88 of the Penal Code (employing propaganda against the state) and sentenced to 4 years in prison and placed under 4 years of house arrest. At the time, he had been holding seminars to teach students about the fundamentals of a free society and the rule of law. Since Mr. Nguyen’s release from prison in 2011, he had been subjected to countless incidents of harassment and surveillance by police officers. He was still recovering from injuries sustained from a vicious assault by masked assailants on 6 December 2015, after he had attended a meeting to mark International Human Rights Day. He was badly beaten, robbed and thrown on the street. Vietnam has ratified the International Covenant on Civil and Political Rights, (ICCPR), which protects the right to freedom of opinion and expression (Article 19), and the right to liberty and security of a person, which includes the right to not be subjected to arbitrary arrest and detention (Article 9). The UN Basic Principles on the Role of Lawyers specifically affirm that lawyers are “entitled to freedom of expression, belief, association and assembly” and that, “they shall have the right to take part in public discussion of matters concerning the law, the administration of justice and the promotion and protection of human rights”. The Basic Principles also set out a number of guarantees to ensure that lawyers are able to fulfill their professional roles without undue interference. Furthermore, Vietnam’s Constitution protects the right to freedom of opinion and speech (Article 25) and guarantees that no citizen may be arrested without a warrant and that the arrest and detention must be in accordance with the law (Article 20). We therefore strongly urge the Vietnamese authorities to comply with Vietnam’s human rights obligations, and drop all charges against Mr. Nguyen and Ms. Le, who have been peacefully carrying out activities to promote and protect human rights. We further urge the international community to strongly intervene at the highest possible levels to support the expeditious release of both human rights defenders. 2000 dollars was deposited to Mrs Paula Hicks-Le Anh Nguyet, NJVACA TD Bank account on 11-10-2014 for VOICE-Canada fund raising. Below is the list of donors. VOICE xin cập nhật tới bạn đọc danh sách quý vị đã quyên góp ủng hộ đồng bào tỵ nạn tại Thái Lan. Đây là danh sách cập nhật lần thứ 4. Trân trọng.